The Woodgatherer, painted for the Salon of 1882, is one of Jules Bastien-Lepage's most important works. 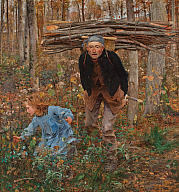 The old woodsman, a family friend, and his granddaughter represent the heavy weariness of old age and the innocence of youth, as well as the passage of time. The remarkable color and handling of paint reflect the artist's unique ability to blend the greater luminosity and atmosphere of the Impressionists with the more conservative, precisionist technique of the Academicians. By the early 1880s, Bastien-Lepage had become the leader of the Naturalist school, and many of his contemporaries believed that he would one day succeed Manet as the leader of modern painting. Thuillier, Jacques. Les écrits de Jacques Thuillier. Pour le plaisir : Rubens, Fragonard, Bastien-Lepage. 2018, p. 330, color detail, p. 331, color illus. Sotheby's, May 18, 2016 [auction catalogue]. New York: Sotheby's, 2016, p. 19, color fig. 4. Sawinski, Catherine. From the Collection--Jules Bastien-Lepage and the Newlyn School. Milwaukee Art Museum: Under the Wings, September 9, 2014. http://blog.mam.org/2014/09/09/jules-bastien-lepage-and-the-newlyn-school/. Bruce, William Blair, Tobi Bruce, and Michelle Facos. Into the Light: The Paintings of William Blair Bruce (1859-1906). 2014, fig. 2.3, p. 68, color illus. Eastberg, John C. and Eric Vogel. Layton's Legacy: A Historic American Art Collection, 1888–2013. Milwaukee, Wisconsin: Layton Art Collection, Inc., distributed by University of Wisconsin Press, 2013, pp. 155, 164–69, 296, 405–06, 457, color pl. 9, p. 169, color details pp. 164, 166–67, 168. Thomson, Richard. Art of the Actual: Naturalism and Style in Early Third Republic France, 1880–1900. New Haven: Yale University Press, 2012, p. 129, fig. 86, color illus. McConkey, Kenneth. George Clausen and the Picture of English Rural Life. Edinburgh: Atelier Books, 2012, p. 67, color illus. figure. 94. Weisberg, Gabriel P. Illusions of Reality: Naturalist Painting, Photography, Theatre, and Cinema, 1875–1918. Brussels: Mercatorfonds, 2010, pp. 26, 28, 49, 53, 137, 156, color illus. (detail) p. 27, color illus. p. 91, p. 162. Cole, Thomas B., MD. The Cover. JAMA, The Journal of the American Medical Association 302, no.9 (September 2, 2009): 927, color illus cover. Gunnarsson, Torsten. Carl Larsson. Stockholm: Nationalmuseum Natur och Kultur, 2007. Lemoine, Serge. Jules Bastien-Lepage (1848–1884). Paris: Nicolas Chaudun/Musée d'Orsay, 2007, pp. 152-53, cat. 53, color illus. p. 153, color detail p. 52. Milwaukee Art Museum News, June 2007, no page number, color illus. Milwaukee Art Museum News, February 2006, no page number, color illus (detail). George, Hardy. Artist As Narrator: Nineteenth Century Narrative Art in England and France. Oklahoma City, Oklahoma: Oklahoma City Museum of Art, 2005, pp.37–48, b/w illus. p. 38, fig. 7. Milwaukee Art Museum News, October 2005, no page number, color illus (detail). Andera, Margaret, Nonie Gadsden, Britt Salvesen, and Laurie Winters. Collection Guide: Milwaukee Art Museum. Milwaukee, Wisconsin: Milwaukee Art Museum, 2004, pp. 21, 68, cat. 27, color illus. p. 21. Milwaukee Art Museum. Building a Masterpiece: Milwaukee Art Museum. New York: Hudson Hill Press, 2001, p. 87, color illus. Jenkins, Adrian. Painters and Peasants: Henry La Thangue and Britain Rural Naturalism, 1880–1905. Bolton, England: Bolton Museum and Art Gallery, 2000, illus. pp. 38–39. South, Will, William H. Gerdts, and Jean Stern. Guy Rose: American Impressionist. Oakland, California: The Oakland Museum, 1995, color fig. 17. Fourcaud, L. de. Exposition des œuvres de Jules Bastien-Lepage. Paris: Impr. réunies, 1995, pp. 23–24, cat. 171, Hathi Trust Digital Library, http://hdl.handle.net/2027/gri.ark:/13960/t0vq37t6g (accessed May 18, 2015). Weisberg, Gabriel P. Beyond Impressionism: The Naturalist Impulse. New York: Harry N. Abrams, 1992, p. 65, b/w pl. 66. Blaugrund, Annette. Paris 1889: American Artists at the Universal Exposition. Philadelphia and New York: Pennsylvania Academy of the Fine Arts and H. N. Abrams, 1989, p. 235. Milwaukee Art Museum. 1888: Frederick Layton and His World. Milwaukee, Wisconsin: Milwaukee Art Museum, 1988, pp. 90-1, cat. 27, color illus. p. 91. Goldstein, Rosalie, ed. Guide to the Permanent Collection. Milwaukee, Wisconsin: Milwaukee Art Museum, 1986, p. 86, color illus. p. 86. Aubrun, Marie-Madeleine. Jules Bastien-Lepage, 1848-1884: Catalogue raisonné de l'oeuvre. Paris: M.M. Aubrun, 1985, cat. 345. Jacobs, Michael. The Good and Simple Life: Artist Colonies in Europe and America. Oxford: Phaidon, 1985, color pl. 1. Rosenblum, Robert, and H. W. Janson. 19th Century Art. New York: Harry N. Abrams, 1984, p. 414, b/w pl. 335. McConkey, Kenneth. Pauvre Fauvette of Petite Folle: a study of Bastien-LePage’s Pauvre Fauvette, Arts Magazine (January 1981): 140–43. Milwaukee Art Center. Mirrors of the 19th Century Taste: Academic Painting. Milwaukee, Wisconsin: Milwaukee Art Center, 1974, cat. 2. Feldman, William Steven. The Life and Work of Jules Bastien-Lepage. New York: New York University, 1973, fig. 3. Milwaukee Journal, March 29, 1959, color illus. Old Favorites at Layton Art Still Favorites. The Milwaukee Journal, July 30, 1939, part 7, p. 7, NewsBank America’s Newspapers, http://infoweb.newsbank.com (accessed August 24, 2017). Summer Brings Strangers to See The Wood Gatherer. The Milwaukee Journal, July 7, 1935, part 7, p. 5, NewsBank America’s Newspapers, http://infoweb.newsbank.com (accessed August 24, 2017). Layton Gallery Pictures Transformed by Bath. The Milwaukee Journal, May 19, 1935, part 7, p. 5, NewsBank America’s Newspapers, http://infoweb.newsbank.com (accessed August 24, 2017). Milwaukee Journal, August 19, 1934, b/w illus. Public Taste Reflected in Favorite Layton Pictures. The Milwaukee Journal, July 23, 1933, p. 7, NewsBank America’s Newspapers, http://infoweb.newsbank.com (accessed August 24, 2017). Layton Art Gallery. Catalogue of the Layton Art Gallery. Milwaukee, Wisconsin: Layton Art Gallery, 1921, p. 44, cat. 102, b/w illus. no. 102. Bashkirtseff, Marie, and Mrs. Mary Jane Christie Serrano. Marie Bashkirtseff: The Journal of a Young Artist, 1860-1884. New York: E.P. Dutton & Company, 1919, entry for Friday, June 15, 1883. Hartmann, Sadakichi. Our American Art Museums: The Layton Art Gallery of Milwaukee. Arts & Decoration 5, no. 12 (October 1915): 464, 466–67, 492, b/w illus p. 464. Layton Art Gallery. Catalogue of the Layton Art Gallery. Milwaukee, Wisconsin: Layton Art Gallery, 1911, illus. opposite p. 42. Thieme, Ulrich, and Felix Becker. Bastien-Lepage. Allgemeines Lexikon der bildenden Kunstler von der Antike bis zur Gegenwart. Leipzig: Engelmann, 1909, pp. 25-26, Internet Archive, https://archive.org/details/bub_gb_UNufAAAAMAAJ (accessed April 5, 2017). Williamson, George C. Jules Bastien-Lepage. Bryan's Dictionary of Painters and Engravers. Vol. 1. London: Bell, 1909, p. 94, Hathi Trust Digital Library, https://babel.hathitrust.org/cgi/pt?id=uc2.ark:/13960/t9b56w01m;view=1up;seq=146 (accessed April 4, 2017). Pattison, James William. The Layton Art Gallery of Milwaukee. Brush and Pencil 3, no. 4 (January 1899): 205, b/w illus. p. 204. Layton Art Gallery. Catalogue of the Layton Art Gallery. Milwaukee, Wisconsin: Layton Art Gallery, 1896, illus. opposite p. 43. Theuriet, André. Jules Bastien-Lepage and His Art: A Memoir. London and New York: T. F. Unwin and Macmillan, 1892, pp. 59 and 73, illus. (engraving) p. 71, illus. (pencil sketch) p. 75, Internet Archive, http://www.archive.org/details/julesbastienlepa00theu (accessed May 19, 2015). Layton Art Gallery. Catalogue of the Layton Art Gallery. Milwaukee, Wisconsin: Layton Art Gallery, 1890. Addition to the Layton Art Gallery, Bastien-Lepage's Father Jacques, The Woodgather hung yesterday. Milwaukee Sentinel, August 9, 1890. Le Père Jacques or The Woodgatherer. Milwaukee Sentinel, May 15, 1890. Milwaukee Sentinel, April 11, 1890. Allis, Edward Phelps. Edward P. Allis: Milwaukee, Wisconsin, 1888, no. 26. Lemonnier, Camille. Le Salon de 1882. Les peintres de la vie, Paris (1888): 280, BnF Gallica, http://gallica.bnf.fr/m/ark:/12148/bpt6k200957j/f136.image (accessed April 5, 2017). Hitchcock, Ripley. A Peasant Painter: Jules Bastien-LePage, St. Nicholas Magazine XV, no. 1 (November 1887): 3-11, illus. p. 5. Dargenty, G. Bastien-Lepage. L'Art. Revue hebdomadaire illustrée, Paris (1885): 166, BnF Gallica, http://gallica.bnf.fr/ark:/12148/bpt6k10558263/f215.item (accessed April 4, 2017). Ducros, Emmanuel. L’exposition de l’oeuvre de Bastien-Lepage. L'Artiste. Journal de la littérature et des Beaux Arts, Paris (1885): 390-394, BnF Gallica, http://gallica.bnf.fr/ark:/12148/bpt6k406273m/f405.item (accessed April 5, 2017). Fourcaud. Artistes contemporains. Jules Bastien-Lepage.Gazette des Beaux-Arts. Courrier européen de l’art et de la curiosité, Paris (January, 1885): 118, 254, 260, 266-267, BnF Gallica, http://gallica.bnf.fr/ark:/12148/bpt6k2031206/f5.item (accessed April 4, 2017). Theuriet, André. Jules Bastien-Lepage: L'homme et l'artiste. Paris, 1885, pp. 47, 90, BnF Gallica, http://gallica.bnf.fr/ark:/12148/bpt6k65688825/f11.image (accessed April 5, 2017). Mantz, Paul. Bastien-Lepage. Le Temps, Paris, December 25, 1884, no. 8641, p. 3, BnF Gallica, http://gallica.bnf.fr/ark:/12148/bpt6k230524v/f1.item (accessed March 23, 2017). Merson, Olivier. Nos gravures, Le Monde illustré, Paris, December 20, 1884, no. 1447, p 390, BnF Gallica, http://gallica.bnf.fr/ark:/12148/bpt6k6447588h/f1.item (accessed March 23, 2017). Bastien-Lepage. Le XIXe siècle, Journal républicain conservateur, Paris, December 13, 1884, no. 4725, front page, BnF Gallica, http://gallica.bnf.fr/ark:/12148/bpt6k7561872t/f1.item (accessed March 23, 2017). Jacques, Edmond. Bastien-Lepage. L'Intransigeant, Paris, December 13, 1884, no. 1613, p. 2, BnF Gallica, http://gallica.bnf.fr/ark:/12148/bpt6k776321r/f1.item (accessed March 23, 2017). Lepelletier, E. Bastien-Lepage. L'Echo de Paris, Paris, December 13, 1884, no. 277, front page, BnF Gallica, http://gallica.bnf.fr/ark:/12148/bpt6k796876d/f1.item (accessed March 23, 2017). Nécrologie: Bastien-Lepage. La Lanterne, Journal politique quotidien, Paris, December 13, 1884, no. 2793, p. 3, BnF Gallica, http://gallica.bnf.fr/ark:/12148/bpt6k7501395f/f1.item (accessed March 23, 2017). Nécrologie. Le Constitutionnel, Journal du commerce, politique et littéraire, Paris, December 13, 1884, no. 346, p. 3, BnF Gallica, http://gallica.bnf.fr/ark:/12148/bpt6k680908z/f1.item (accessed March 23, 2017). La vie à Paris. Le Temps, Paris, December 12, 1884, no. 1794, p. 2, BnF Gallica, http://gallica.bnf.fr/ark:/12148/bpt6k230511c/f1.item (accessed March 23, 2017). Nécrologie: Bastien-Lepage. Journal des Débats politiques et littéraires, Edition du matin, Paris, December 12, 1884, p. 3, BnF Gallica, http://gallica.bnf.fr/ark:/12148/bpt6k463049v/f1.item (accessed March 22, 2017). Nécrologie: M. Bastien-Lepage. La Justice, Paris, December 12, 1884, no. 1794, p. 3, BnF Gallica, http://gallica.bnf.fr/ark:/12148/bpt6k771039t/f1.item (accessed March 22, 2017). Nouvelles diverses. Bastien-Lepage. Journal de Rouen, Rouen, France, December 12, 1884, no. 274, p. 2, Archives départementales de Seine-Maritime, http://www.archivesdepartementales76.net/ (accessed March 22, 2017). Bastien-Lepage: Mort de l’auteur des Foins. Le Matin Paris, December 11, 1884, no. 290, front page, BnF Gallica, http://gallica.bnf.fr/ark:/12148/bpt6k5521125/f1.item (accessed March 22, 2017). Fourcaud. Bastien-Lepage. Le Gaulois, Paris, December 11, 1884, no. 882, front page, BnF Gallica, http://gallica.bnf.fr/ark:/12148/bpt6k525227t/f1.item (accessed March 20, 2017). Arthur Tooth & Sons. The Artist and Journal of Home Culture 3, no. 36 (December 1, 1882): 365, Hathi Trust Digital Library, https://hdl.handle.net/2027/uiug.30112117953932 (accessed March 20, 2017). Wedmore, Frederick. The Exhibitions at Tooth's and at Maclean's. The Academy 22, no. 548 (November 4, 1882): 336, Hathi Trust Digital Library, https://hdl.handle.net/2027/inu.30000080760204 (accessed February 15, 2019). Burty, Philippe. L'exposition des Beaux-Arts (Salon de 1882), par Goupil and Cie. Paris: L. Baschet, 1882, pp. 81-82, b/w illus. p. 81, Internet Archive, https://archive.org/details/lexpositiondesbe00salo (accessed March 20, 2017). Ducros, Emmanuel, Une cigale au Salon de 1882, Paris, 1882, p. 82, b/w illus. p. 83, Hathi Trust Digital Library, https://hdl.handle.net/2027/njp.32101063575789 (accessed March 6, 2017). Dumas, François Guillaume. Catalogue illustré du Salon. Paris: Librarie d'Art L. Baschet, 1882, no.127, illus. p. 174, BnF Gallica, http://gallica.bnf.fr/ark:/12148/bpt6k2135725.image# (accessed May 18, 2015). Forbes-Robertson, John. The Salon of 1882. The Magazine of Art 5 (1882): 415, Internet Archive, https://archive.org/details/magazineofart05londuoft (accessed March 20, 2017). Hoschedé, Ernest. Impressions de mon voyage au Salon de 1882. Paris: Tomer, 1882, p. 11, BnF Gallica, http://gallica.bnf.fr/ark:/12148/btv1b54000115g/f11.image (accessed March 6, 2017). Laprairie, J.A. La Mosaïque au Salon de 1882: Bastien-Lepage. Le Père Jacques. La Mosaïque, Revue pittoresque illustrée de tous les temps et de tous les pays (1882): 166, BnF Gallica, http://gallica.bnf.fr/ark:/12148/bpt6k62985879/f6.item(accessed March 20, 2017). Leroi, Paul. L'Art, Revue hebdomadaire illustrée, dir. Eugène Véron. Paris: Librairie de l'Art and London: Remington and Co., 1882, Vol. 3, p. 114, BnF Gallica, http://gallica.bnf.fr/ark:/12148/bpt6k10557720/f13.item (accessed March 20, 2017). Fine Arts: The Salon, Paris. The Athenaeum: Journal of Literature, Science, the Fine Arts, Music, and the Drama, no. 2850 (June 10, 1882): 737, Hathi Trust Digital Library, https://hdl.handle.net/2027/njp.32101077276390 (accessed March 20, 2017). Mériem, Jean. Tableaux et statues (Salon de 1882). Paris: Baschet, 1882, pp. 106–107, Internet Archive, https://archive.org/details/tableauxetstatue00meri (accessed March 20, 2017). Penguin. Art Abroad: The Paris Salon. The Artist and Journal of Home Culture 3, no. 30 (June 1, 1882): 187, Hathi Trust Digital Library, https://hdl.handle.net/2027/uiug.30112117953932 (accessed March 20, 2017). Saint-Juirs. Guide critique du Salon de 1882, Supplément du journal Le Clairon. Paris, 1882, pp. 15-16 Internet Archive, https://archive.org/details/guidecritiquedus00pari (accessed March 20, 2017). Véron, Théodore. Dictionnaire Véron, ou mémorial de l'art et des artistes de mon temps, 8e annuaire de l’art et des artistes contemporains, Salon de 1882. Poitiers: Théodore Véron and Paris: M. Bazin, 1882, p. 28, BnF Gallica, http://gallica.bnf.fr/ark:/12148/bpt6k9693431m/f58.item (accessed March 20, 2017). Illusions of Reality: Naturalist Paintings, Photography and Cinema, 1875–1918, Van Gogh Museum, Amsterdam, The Netherlands, October 8, 2010–January 16, 2011; Ateneum Art Museum, Helsinki, Finland, February 14–May 15, 2011. Jules Bastien-Lepage, Musee d’Orsay, Paris, France, March 5–May 13, 2007; Centre Mondial de la Paix, Verdun, France, June 14–September 3, 2007. 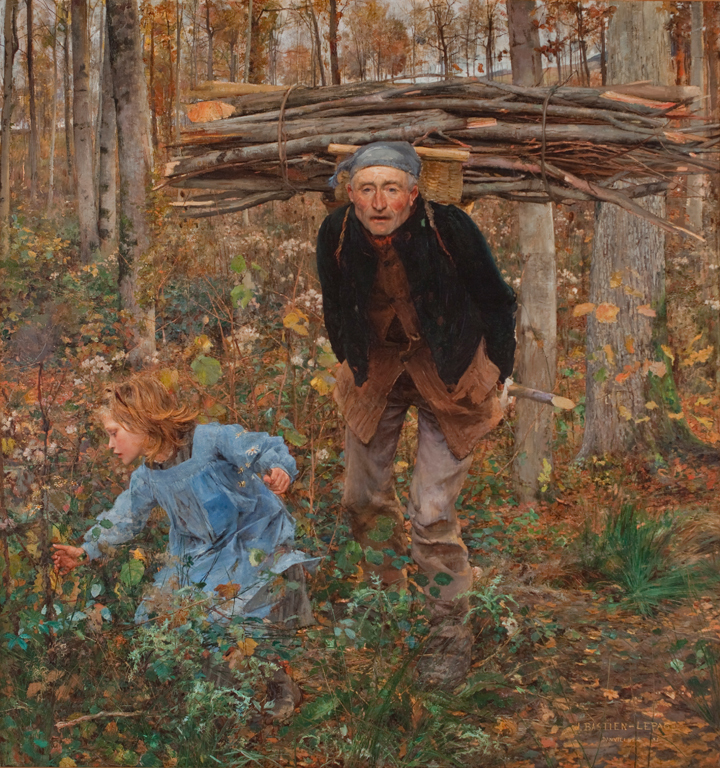 Painters and Peasants: Henry La Thangue and British Rural Naturalism, 1880–1905, Bolton Museum and Art Gallery, Great Britain, April 8–June 3, 2000. 50th Anniversary Exhibition, Portland (Oregon) Art Museum, December 1942. Jules Bastien-Lepage, Ecole Nationale des Beaux-Arts, Hotel de Chimany, March–April 1885.